North Philly featherweight Harry Blitman kicked off the most eventful year of his entire career on this day in 1928. The lefty decisioned Pete Nebo over 10 rounds at the Arena to run his record to 29-0. Later on in the year, Blitman would experience his biggest-ever win as well as his very first loss. It was a tumultuous 12 months. That June, Blitman faced champion Tony Canzoneri, in an outdoor non-title bout at Philadelphia's Baker Bowl. Canzoneri was the clear favorite but Blitman pulled a shocker, winning a 10-round decision in the highlight of his 8 years in the ring. 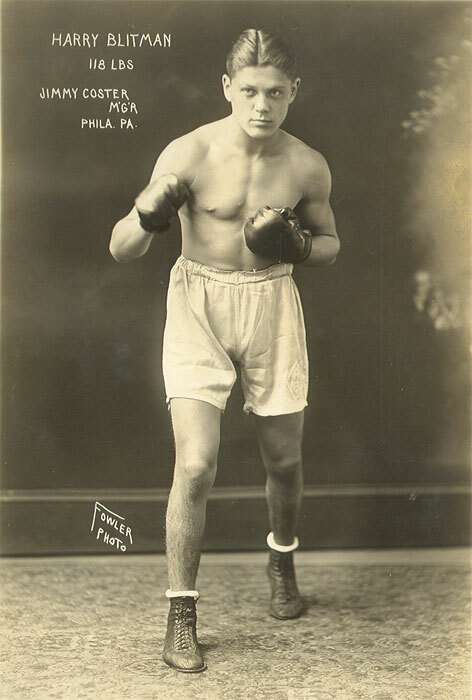 Later the same year, Blitman fought fellow Philadelphian Benny Bass at Shibe Park in another high-profile outdoor bout. Bass, who lost an earlier title war to Canzoneri, was looking for a second shot, while Blitman needed the win to secure his own rematch with Canzoneri. In one of the all-time great Philly slugfests, Bass KO'd Blitman in 6 to knock him out of title contention.